Yeah, probably. I’m pretty sure vaudeville was considered theater (I’m absolutely sure vaudeville was considered theater), and those shows were the ultimate in variety. While vaudeville doesn’t exist in the same way that it did 90 years ago (except in purposeful, stylized shows, like one I directed a few years ago), variety shows still do. 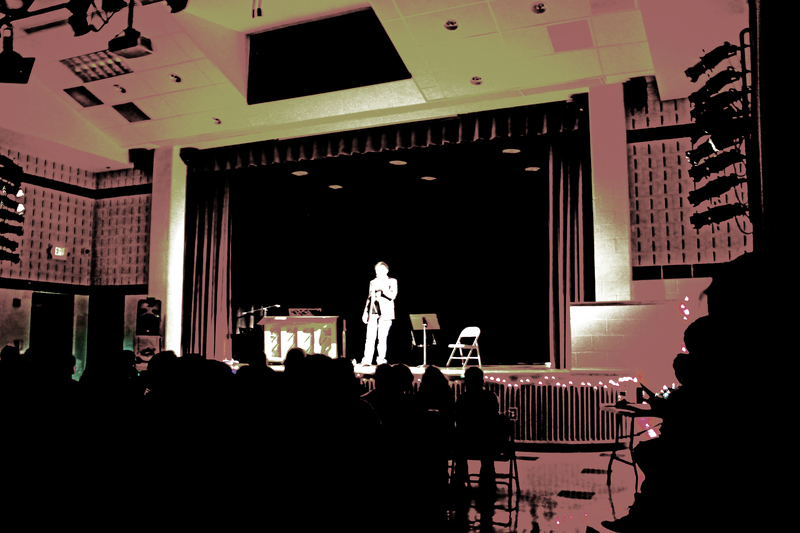 Whether it’s a school talent show, a fundraiser, a showcase of original work, or a presentation of several scenes, variety shows offer a nice, quick, entertaining experience for an audience. I produced one a few months ago (it was my second, and this one was absolutely better than the first, thanks to some important lessons that I learned) in a short period of time. It was very successful. Here are some tips for producing one on a budget and with limited lead time. Granted, if you already have a space that you can use for free, it helps immensely (which I did), but if you don’t, I’ll offer some suggestions at the end. First thing to do is establish a theme. What are you trying to accomplish? Is it a scene showcase? Original works? Prepared presentations? A mixture of everything? All of this matters in terms of time and effort. But for the sake of this post, and the whole “limited time and budget” thing, let’s assume that the performers have an idea of what they want to do. Seek out the best performers. It doesn’t matter if they play music, write poetry, act, whatever. Get the ones who have the talent, can work on the talent, and will shine. This seems obvious. When you hold auditions, ask the performers to show you what they plan on doing at the show. This gives you a sense of what they can do, and helps you – early on – in figuring out an order for the show (the genre of the performance determines where it goes in the rundown – you don’t necessarily want too many of the same thing grouped together). It also lets you, as the director, know how much work you will need to do with each performer. Once the cast is chosen, the next thing to do is order the show. I recommend that each performer get 5-7 minutes on stage. 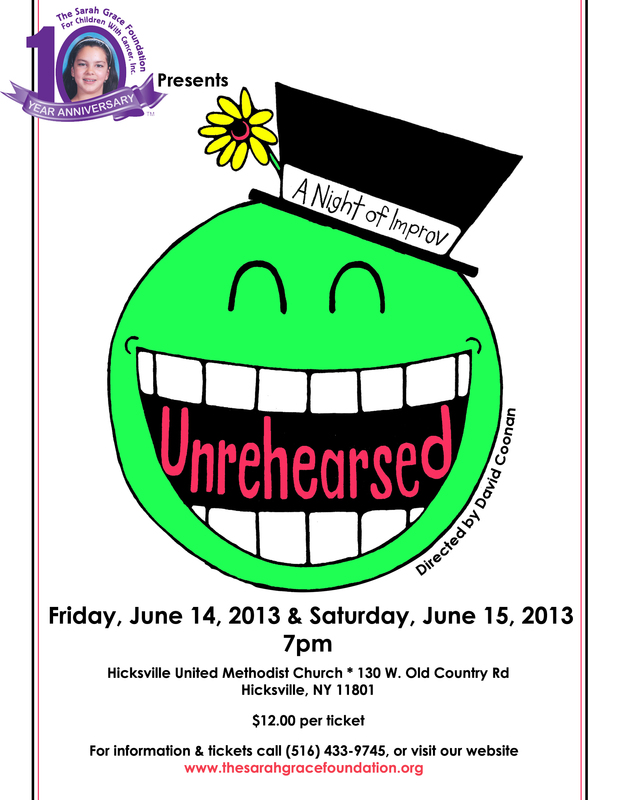 If you have a show of 12-14 performers, with an intermission, you have a 90 minute show. Throw some refreshments in there, some local artwork for the audience to browse, and you have a terrific evening of varied entertainment that doesn’t take too much time. Audiences these days like to be engaged quickly. The attention span of an audience shrinks with the attention span of each subsequent generation. Chances are, this isn’t the same mix of people that showed up to your production of Hamlet, so keep that in mind when figuring out running time. Of course, this is just a suggestion, and if you want to do a 7 hour variety show, you have my full support. Next, the rehearsals. Since we’re sticking with the short-time theme, 2-3 rehearsals should suffice (provided everyone in the cast does his or her homework, including the host). These rehearsals will be used to polish the performers and run the show. Provided you, the director, know what each person is doing, you have a general idea of what needs to be fixed. If you have a background in theater, literature, and music, you can pretty much help each performer with what they need. If you don’t, ask other performers or friends to help out. I’m sure the other, stronger, cast members will be glad to help because it contributes to the overall quality of the show. Run each act in order, with cast backstage. Get everyone used to show conditions, since they have few opportunities before the show to do so. During the first rehearsal, stop the acts to correct them and work with each person. This is good and normal. Fix them early. The cast will have to wait and understand. During the second rehearsal, run act 1, give notes to the performers, then run act 2, and repeat. During the third rehearsal (if you get one), run the entire show while you watch and take notes. Hopefully, by this point, everything is close to show level. On the night of the show, have a quick review with the performers. Go over any final notes that you have. Some cast members will not need this. Some will need more. You know them best. On the night of the show, remind them of show conditions: everyone stays backstage; no one waves to their families; don’t come out until the show is over; be quiet or face my wrath. Make sure you have a stage manager – even if it’s a cast member – to keep order. Assign duties – when to play certain music; make sure the microphones are set and at the proper height; help the performers get ready. You’ll be able to relax knowing that the backstage is taken care of while you’re out front. Make sure the order is clear and everyone knows when they are supposed to come out. Have the order posted backstage. The host should also have a copy. And, of course, review the curtain call procedure. I like to keep it simple. Everyone out at once, bow, point to lighting folks, accept applause, bow again, accept more applause, politely leave the stage. Then they can enter the house and see their guests. The stage is sacred: do not use it to advance your ego. That’s what the diner is for after the show. A host isn’t really required for a variety show, but believe me, it makes the show so much better. The job of the host is to fill in the space between the acts, introduce the acts, talk them up, and basically entertain the audience between performers. Find someone charismatic, who commands the stage and keeps the energy high. Have your host create his (or her) own material, but make sure it’s good. Some gentle guidance or suggestions may have to come into play. If you find the right person, this won’t be an issue. Have auditions for this part as well. If you have a place already, terrific. If not, depending on the size and your creativity, you may want to look into local churches, libraries, and other community centers. A variety show is bound to bring a community together, and you’ll pull a pretty nice crowd with some simple advertising (again – churches, libraries, and other community centers). Have someone from the cast make up some simple flyers, black and white, and have them run off at Kinkos or somewhere else with a copy machine. Remember, people come to see their friends and family members, especially if it’s a one-off show. Do you charge? Well, it depends where the money is going. I recommend you use your common sense and judgment here. You’ll know the right thing to do that fits your unique situation. Following the first rehearsal of this year’s “Unrehearsed” show (see my post on last year’s show here), the cast (pictured below) and I sat around to talk about improv. The idea wasn’t mine, actually. One of the cast member’s, Mike, had suggested that we do this simply because he loves performing and loves talking about it. So I decided to bring in the rest of the cast. They are a great bunch of passionate actors and are full of insight. The cast. 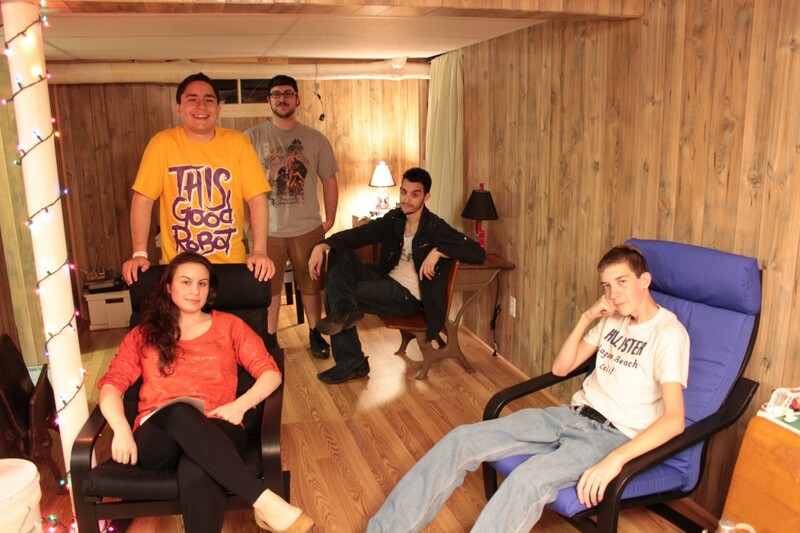 From left: Potoula Anagnostakos, John Ortiz, James Weippert, Michael Pagano, Matt Waldman. Aside from the main reason why we’re doing it, creating and participating in a show like this is a tremendous amount of fun. And if done well, is a real treat for the audience. Please listen to the entire conversation for the full effect. It’s only 16 minutes long and will be exponentially more interesting than the few highlights I’m about to type. The actors focused mainly on communication, in one form or another. All theater requires a tremendous amount of communication, but, as they point out, improv requires a focus not needed in other forms of theater. Since the actors don’t know what’s going to happen, it is all based on listening, observing, and responding. And it’s tough. Which brings me to my next point. The host. The person who holds it together: chooses the scenario, the performers, and relays all of the necessary information to the audience. He needs to be just as in tune with the actors as they are with each other. There are many “rules” and “guidelines” to keep in mind when doing improv, and you can find many of them in my previous post (linked above), but from just spending 16 minutes talking to these people that I’ve been working with constantly for several years, it really began to dawn on me that the best way to become better at improv is to do improv. And do it with people that you know will make you better, because they’re relying on you for the same thing.